Kjell Nupen is a Norwegian artist, whose most important medium is painting. His canvases are contemplative meditations in paint. Their atmosphere is often somewhat melancholic, evoking the ‘blue hour’, the moment of the day, at dawn and at dusk, when time seems to stand still in a quiet in-between – a perfect atmosphere for meditation. A deep blue plays a leading role in Nupen’s work. His works of art are not totally abstract, but it doesn’t mean that they are narrative; Nupen does not represent or tell a story. Even though there are some recognazible representative elements in his works, they do not form a clear story. The artist has a penchant for motifs from nature, especially trees and birds. Another recurring motif is a boat asa hymn to the journey. 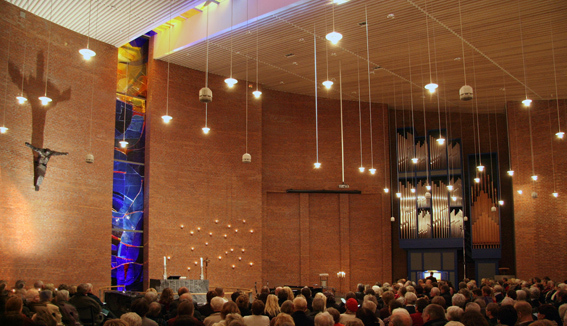 Nupen provided the church of Geilo (see the images above) with two large windows of 13 m. high. They rise up behind the altar, separated from each other by a small strip of wall. 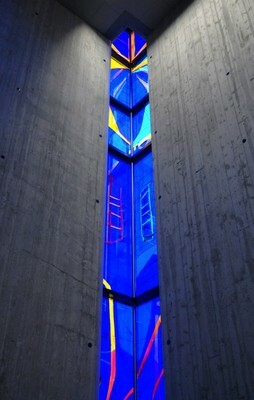 The colours of the windows determine the effect, with purple/blue below and orange/yellow at the top. 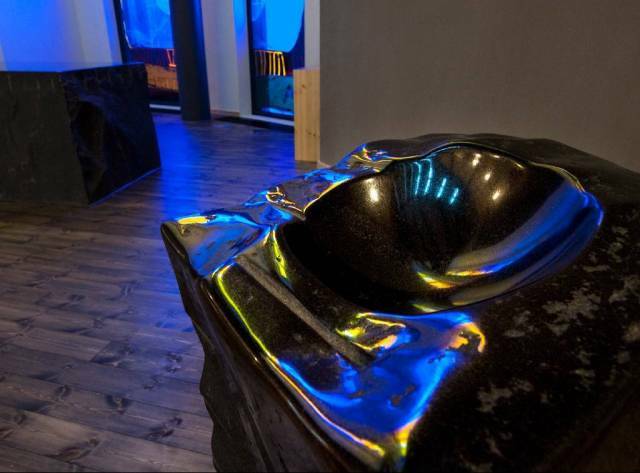 The coloured light is projected on the floor and walls of the worship space and reflected by the baptistry and the polished surface of the granite altar, which were also designed by Nupen. The artist remarks: ‘Here one truly paints with light. It changes continually. I especially payed attention to how the light comes in during the Sunday service and plays across the baptistery.’ In addition he made a two meter high bronze crucifix that he placed on the wall to the right of the windows. Nupen gave to the windows, altar, baptistery and crucifix together the name ‘The Unending Journey’ (Den uendelige reise), a name that wants to evoke an atmosphere rather than force a closed interpretation on the viewer. It is important to Nupen that everyone can find their own meaning in his predominantly abstract work, so that each person can make it meaningful for themselves in their own way. His work in 2010 for the church of Geilo was not Nupen’s first ecclesiastical commission. 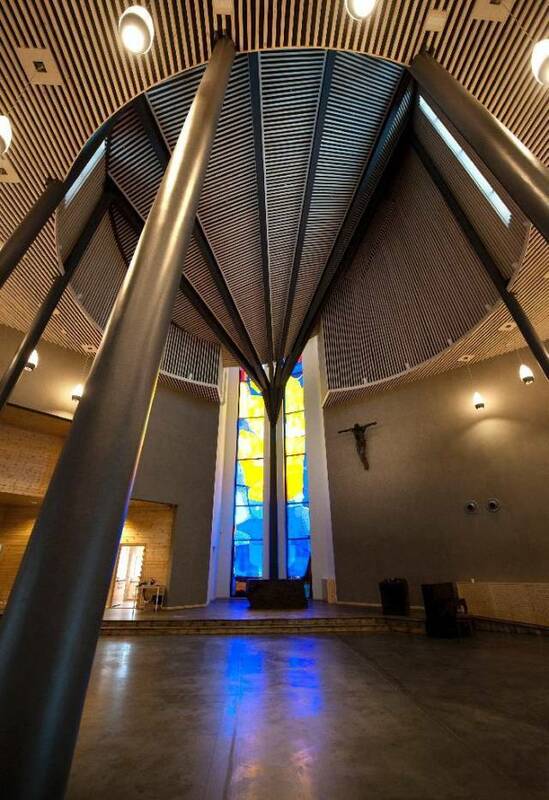 He made windows and interior designs for a series of churches. 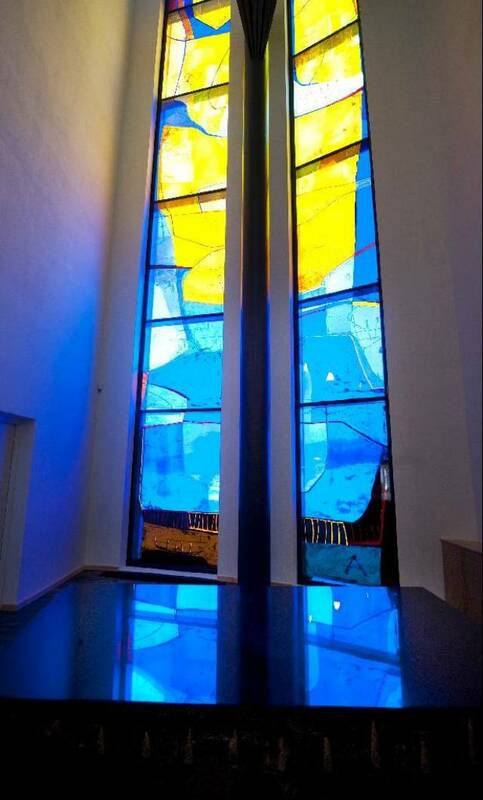 His first commission was for the church of Søm in Kristiansand (his birthplace where he also lives today), for which he created windows, baptistries, the altar and a crucifix between 2002 and 2004. The similarity with his work for the church of Geilo is striking. In Søm the monumental window divides the church in two. It runs from behind the altar to the ceiling, proceeds through the middle of the ceiling to the back of the space and runs down again to the top of the entrance door. Nupen called the window ‘From Darkness to Light’. 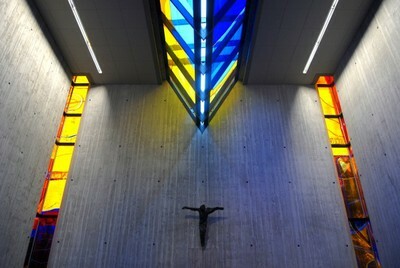 In 2008 the Chapel of Ansgar in Kristiansand was completed. The chapel is part of the Bible School of Ansgarskolen of the Norwegian Mission (Det Norske Misjonsforbund). This time Nupen surprised the responsible committee by showing up with a total design for the church. The dimensions of the concrete cube are similar to those of the sanctuary of the Temple of Solomon: 9 x 9 x 9 meter (9 meter is 20 cubits), see 1 Kings 6:20. We see the same favoured colours again as well as boat and ladder motifs. Also here a window runs through the middle of the ceiling, now in the form of a triangle that is pointing down. The artist placed windows in the corners of the square structure, which is all the more remarkable because corners normally need to be extra solid and strong in order to bear the weight. The corners of glass make for a dynamic space that is contradictory in character, open as well as closed, fragile as well as solid, dark and light. 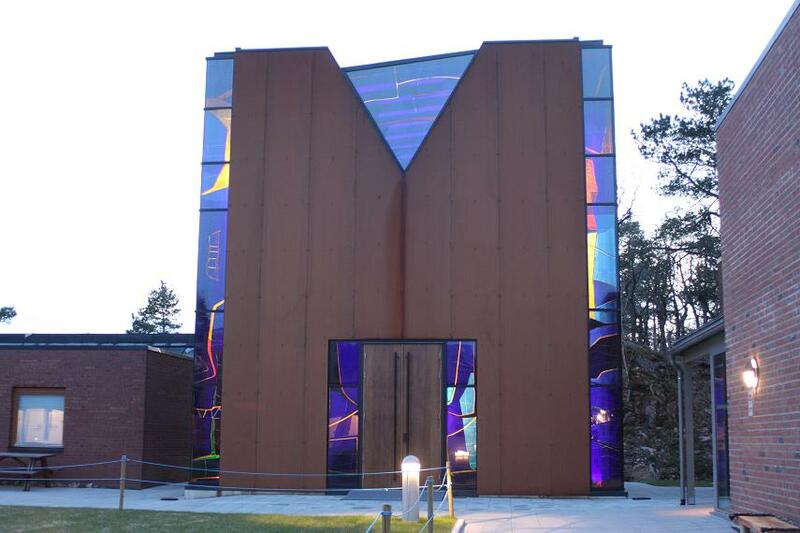 For the bisshop of the Lutheran Diocese of Agder, Olav Skjevesland, the structure is loaded with a deep theological meaning, as the dimensions of the chapel symbolise the Old Testament, while the light falling through the windows refers to Christ and the New Testament. In this instance there is no large window behind the altar, but just a small square yellow one. To most of the parisioners and visitors the colours and light are the essential part of the effect, not so much on a symbolic and theological level, but because they create a serene and beautiful atmosphere that is highly conducive to meditation and contemplation. This is exactly what Kjell Nupen wanted to achieve. 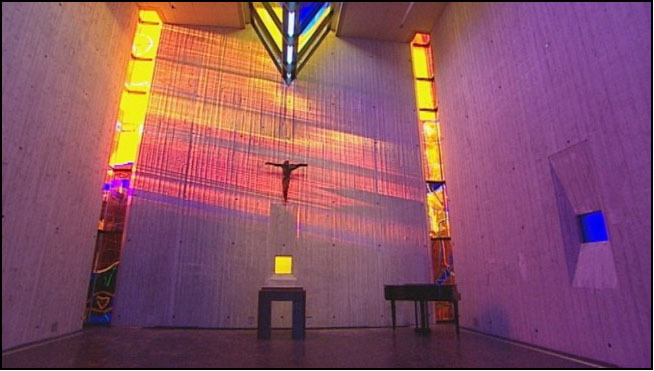 In Ansgar he could create a space in which the visitor is literally immersed, due to the effect of the light that pours a fan of colours across the liturgical space. An-Magritt Granli, the pastor of the church in Geilo, remarks that when people come into this space, they are lifted up into another dimension. To achieve this effect Nupen does not make use of biblical stories or Christian motifs. To conjure up this atmosphere he strives for a spirit of ‘humility, deep respect and wonder’, while also seeking silence. This is a shortened translated version of the article ‘Kjell Nupen: “le peintre de lumière” à l'œuvre dans l'église culturelle de Geilo’, that was published in 2011 on the Narthex website, see www.narthex.fr/blogs/chroniques-scandinaves/kjell-nupen-le-peintre-de-lumiere-a-loeuvre-dans-leglise-culturelle-de-geilo. Here you can also view more photos of these churches. Kjell Nupen (1955) was born in Kristiansand. As young as 13 he decided to become a painter. He has studied at the National Academy of Fine Art in Oslo and at Staatliche Kunstakademie in Düsseldorf. He achieved a professional breakthrough as a relatively young painter and graphic artist and has been a noted figure in Norwegian contemporary art for many years. Nupen has exhibited his works in many countries. When he was just 20 years old his works were acquired by a number of major institutions. Kjell Nupen has carried out several commissions. The best known of these is the design of Otterdalparken in Kristiansand, a sculpture installation which opened in 1991. Kjell Nupen’s art from the 1970s was largely motivated by criticism of the society existing at that time. During the 1980s the political and aggressive aspects of his work were toned down and his art became more contemplative. Landscape scenes began featuring in the artist’s repertoire and an emphasis on coloristic and formal qualities has since played a major role in Nupen’s art. Kjell Nupen has lived along the south coast ofNorway for most of his working life. Interestingly the work that was commissioned for him at Geilo is much more to the north of Norway, between Bergen and Oslo. He currently resides in Kristiansand. See www.kjellnupen.com. Caroline Levisse is a French art historian, who is presently working in Copenhagen in Denmark on a dissertation about religion in contemporary Scandinavian art.